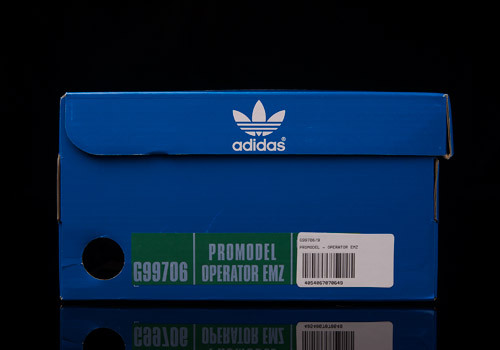 In light of adidas’ Collector’s Project releasing this Saturday, the 26th of October, 2013, we’ve decided to drop an article featuring the fantastic Pro Model 80s by Operator Emz. 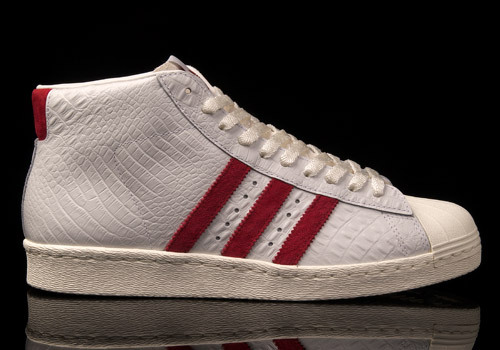 We’re more than excited to dive into adidas’ latest Consortium release, the enthusiast-based Collector’s Project. 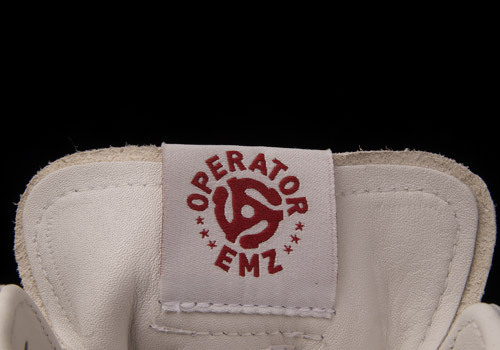 One by one we’ll be interviewing each participant, beginning with Operator Emz (aka Michael Greene), an American DJ and massive adidas aficionado from New York. So without further ado, let’s welcome the musically oriented sneaker freak into our Berlin offices for a bit of back and forth about his life and participation in the project. Hey Op, how did you first get approached by adidas for this collaboration? Bradley C. from adidas here in the USA approached me. He knew how passionate about the brand I am and when this project came up he put me down. Sounds easy enough! Now, being a musician and someone that is already ‘on stage’, so to speak, how did your fan base react when finding out about your collaboration? My people are very excited for me. Most people know how into adidas I am, so it’s a natural fit. That it is. 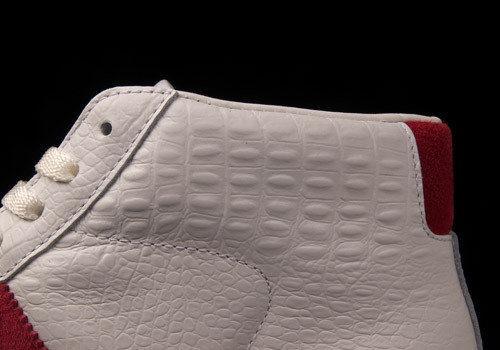 And as the ‘American’ in the project did you feel obligated to represent a louder, bolder, higher-top style? 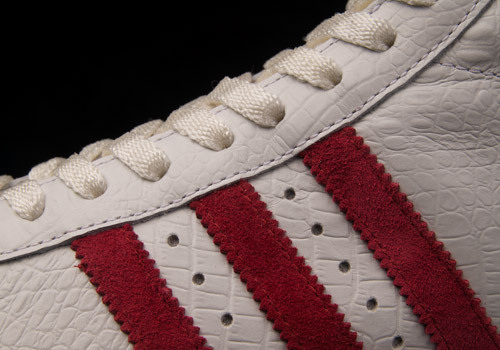 Especially regarding the shell toe references to Run D.M.C., did you feel it was just a necessity to bring that American heritage to life in your shoe? I just remember the Pro Model as a shoe the older cool dudes had when I was a pre-teen and I don’t think adidas has really done the Pro Model 80s right yet, up until now. It’s a tricky silhouette to satisfy, that’s for sure. 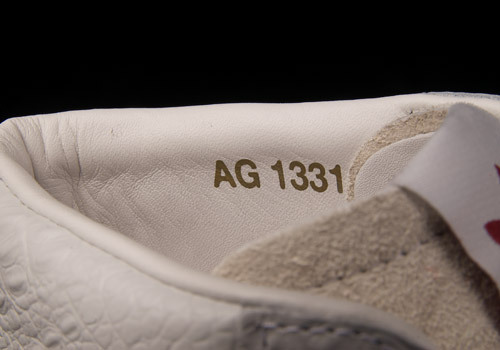 As far as your own sneakers, you mention yourself as a connoisseur, and not a collector. 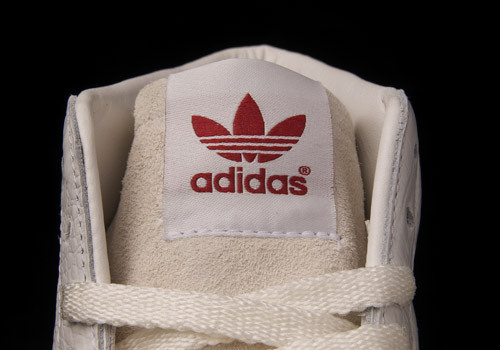 But we’re wondering if you purchase any other adidas products besides sneakers? 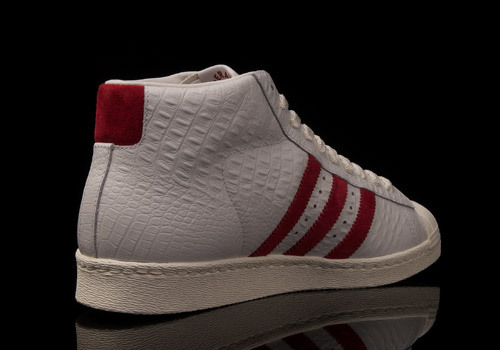 I’m really into adidas Leather Jackets as well as the shoes. Ok, nice one, and regarding the shoes, how many of your owned items are vintage versus new release? Do you wear your gear or is anything kept nice, on ice, and deadstock for the future? I have almost fifty fifty, half vintage, half newer stuff. I wear all my vintage pieces, and I don’t have anything that’s deadstock. Definitely not a collector then, by definition it seems. We loved to hear about your ‘dilemma’ you mention in the teaser video going around the web, and how you wanted to truly show off a classic, clean, white silhouette with some simple color stripes but throwing in an “Operator Emz-ish” flavor to “freak it” in your own way. Can you tell us how you decided to do this, in the end? I think the reptilian and suede are one hundred percent me. I wear a lot of snakeskin and suede on the regular, and that’s an ’80s staple. I think if I ever have the chance to do them again I would go super flashy and obnoxious. 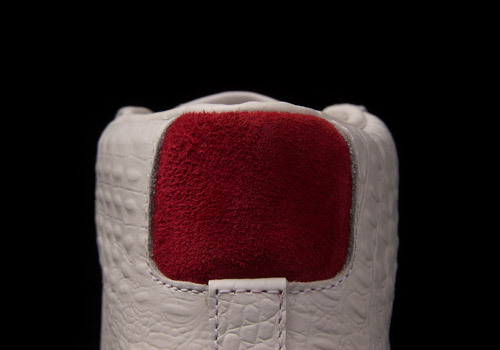 That could be interesting, though we’re glad you stuck to a classic colorway for this round. Speaking of classics, you reference Run D.M.C. 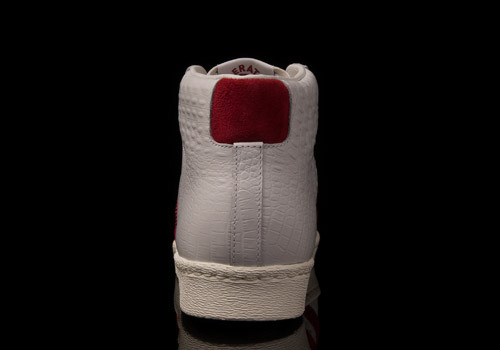 and obviously their style – that old school, New York style – is important, so did you consider to add in the elastic bands on the tongue in order to allow the wearers to rock the shoe without laces? No, I wanted to keep the original feel of the Pro Model. 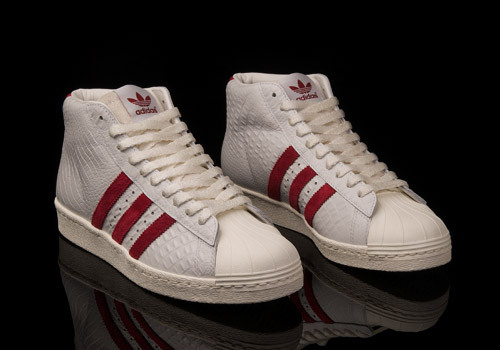 The Ultrastar is actually the model of shell toes with the elastic bands. We hear that, staying true to that OG form. 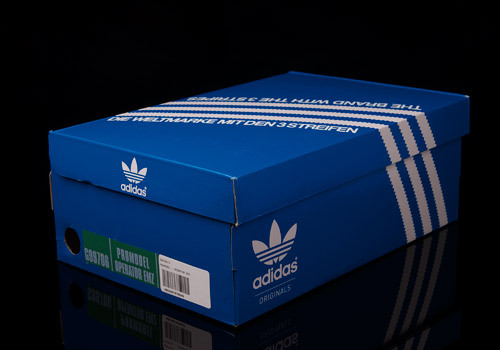 Lastly, on that topic of nostalgia and past times, what can you tell us about your in-depth thoughts on adidas’ connection to cultural history? I think adidas has a shoe for all walks of life. My age group has childhood memories of rocking adidas and the younger generations just realize that the shoes are stylish and functional. Fair enough. Well, Emz, it’s been great having you here and hearing about your angles and enthusiasm. We’re hoping the excitement of the release continues to lead you down successful paths. 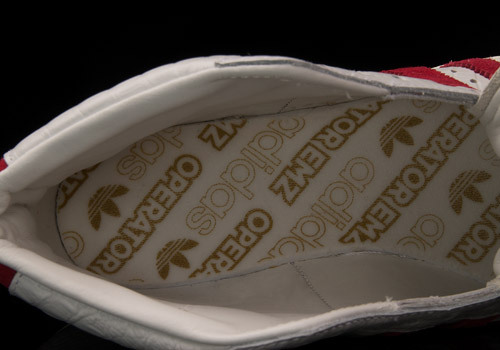 Congratulations and here’s to the future of the adidas Pro Model 80s, pushed forward in OG form and Opertar Emz’ style!